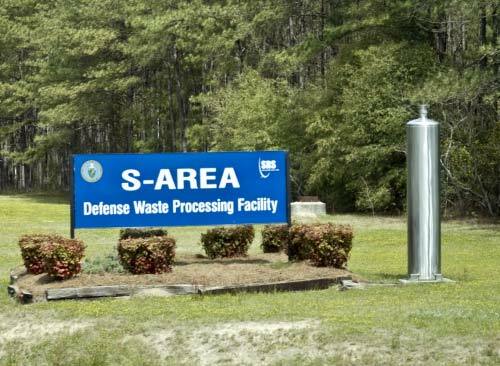 In the S Area of Savannah River Site, radioactive waste is packaged in stainless steel canisters at the Defense Waste Processing Facility. The canisters are ten feet tall, two feet in diameter, weigh 1,000 pounds when empty, and can hold 4,000 pounds of waste. The waste is made immobile by packing it in molten glass via a process known as glassification or vitrification. The sight of one of these canisters may not evoke the image of a "tall, cool one," but the original manufacturer happened to be Coors Brewing Company. Over time the contract has changed hands a few times and is currently held by Teledyne Brown. The immobility that results from glassification locks dangerous materials in a stable condition. Nevertheless, some canisters are still "hot" – emitting extremely high levels of radioactivity. A single canister can emit 6,000 rem per hour. To put this into perspective, a lethal human dose is 500 rem over one's entire lifespan. Canisters take about a day to fill and are then welded shut. All of this work is done remotely by machines. More dangerous radioactive liquid waste is temporarily stored in what are called tank farms, located in F Area and H Area, awaiting disposition through SRS's waste processing facilities.1 There is currently no plan for their long-term storage. DOE officials have stated that the waste stored in the 49 large waste tanks is "the single greatest environmental risk in the state of South Carolina." Update: Clean-up work of the nuclear waste continues but is still a risk. Read a full article at Officials Report Nuclear Progress, published June 2011.